Visit the showcase site for Astronomy: At Play in the Cosmos. Astronomy: At Play in the Cosmos brings popular science writing to a textbook. 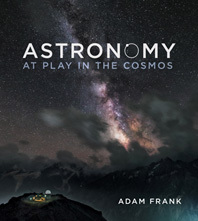 In every chapter, author Adam Frank—a co-writer of the NPR blog “13.7 Cosmos and Culture”—integrates two interviews with leading scientists, a fascinating second voice that drives the narrative while making astronomy feel immediate, relevant, and real for students, and still capturing science’s human nature. As he wrote the text, the author considered how to enhance reading by making the science interactive. Highlighted with icons in the book and ebook, 50 fun easy-to-use Interactive Simulations help students grasp physical and mathematical concepts by asking them to interact with the figures and bringing textbook art to life. Astronomy: At Play in the Cosmos includes SmartWork5 and Norton ebook access. Learning Astronomy by Doing Astronomy, a workbook offering collaborative lecture activities, can be packaged with the text at no additional cost. For the instructor no longer interested in a print text, we offer a digital option which includes SmartWork5 and the ebook at a fraction of the cost. Is there life beyond Earth? is a question commonly asked by those taking introductory astronomy. Rather than relegating astrobiology to the last chapter, Frank explores this topic in Chapter 9. This placement is ideal for instructors interested in teaching this material but who often run out of time at the end of the term. SmartWork5 coaches students with hints that help them understand key concepts while enabling instructors to assess student progress. Each question links to the appropriate section of the Astronomy: At Play in the Cosmos ebook and, for every chapter, SmartWork5 includes pre-made assignments written specifically for this textbook. Smartwork5 in phone and tablet compatible and integrates with the most popular campus learning management systems.